WASHINGTON—President Donald Trump formally nominated Thomas Homan to lead Immigration and Customs Enforcement (ICE) on Nov. 14. Homan has served as acting director since Jan. 30, after former director Sarah Saldaña stepped down when Trump came into office. Homan worked for 33 years in immigration enforcement, starting as a Border Patrol agent in 1984. He spent 20 years as a special agent investigating the organizations that smuggle aliens into the United States, and then eight years under former President Barack Obama in charge of ICE’s Enforcement and Removal Operations. “I actually retired on Jan. 27 for about three hours. On the way out of the ceremony, I got a call from General [John] Kelly [saying] that the president would like me to stay and run the agency,” Homan said at an event at The Heritage Foundation on Oct. 17. He used the podium to express his frustration with negative media reports about ICE operations. We’re not going to be bullied into not enforcing the law. “If you’ve seen what Tom Homan has seen in 33 years, you would understand my emotion when we talk about this issue,” he said. Homan held back tears as he recounted a 2003 case in Victoria, Texas, where 19 smuggled aliens died in the back of a tractor-trailer. “The crime scene was kept secure until I got there. I actually walked into the back of that tractor trailer—I was surrounded by 19 dead aliens laying around me, that suffocated in the back of the tractor-trailer. One, a 5-year-old boy. That haunts me to this day, because I had a 5-year-old boy at the time. “What do you think that 5-year-old child went through in the last 30 minutes of his life? What do you think the father, who was holding that child, went through the last 30 minutes of his life, knowing he put his child in that position and couldn’t change it? And they suffocated to death in this black, hot tractor-trailer. Homan’s pet peeve is sanctuary cities, jurisdictions that create policies to prevent local and state law enforcement from communicating and cooperating with federal immigration authorities. Some sanctuaries, such as in Chicago, New York City, and Los Angeles, forbid immigration agents from going into jails to interview and take custody of convicted criminal aliens. The criminals are instead released back into the community. “That doesn’t make sense to me,” Homan said. “Every criminal alien that gets released by a sanctuary city that reoffends, has committed a crime that’s preventable. 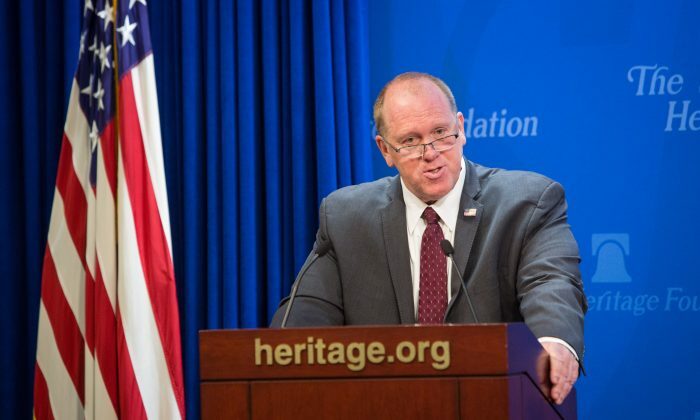 Homan said that as of July 31 this year, almost 10,000 criminal aliens who were released onto the streets—rather than being turned over to ICE—have committed another crime. Proponents of sanctuary policies say that the policies promote trust in immigrant communities and, therefore, immigrants will come forward to report crimes—purportedly making the community safer. But Homan said his agents—and the community—are put at greater risk if ICE is forced to locate and arrest illegal aliens in communities, rather than take custody of them in a jail. “What you have done is force my hand and now I have to go to their homes. When I go into the home and find that bad guy, he’s probably going to have other people with him, who may have immigration issues. My job is to take them into custody, too,” he said. 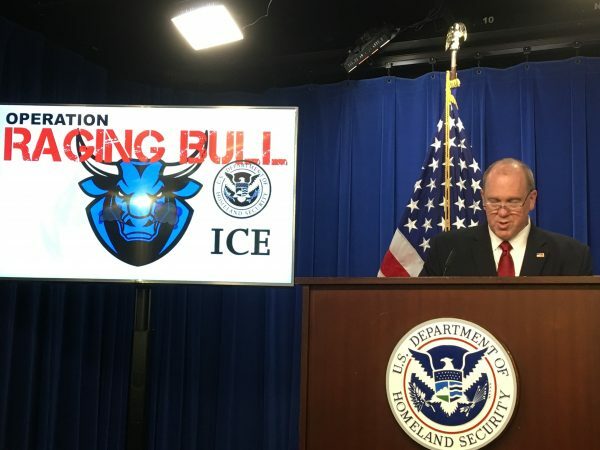 Homan said ICE has a “sensitive location” policy, which precludes agents to arrest illegal aliens at churches, schools, and hospitals without prior approval from headquarters. “And it has to be a significant public safety issue and national security issue to do that,” he said. He said politicians and media stoke fear about ICE, and at the same time, groups that advocate for illegal aliens tell them not to answer their door at home to ICE. “So we can’t arrest them in the jail, we can’t arrest them at their homes because they won’t open their doors and cooperate with us because they’ve been trained not to—what option does that leave us?” Homan said. Homan said the United States spends billions of dollars a year on border security, detention, immigration courts, attorneys, and appeals courts. “And at the end, if a judge issues a final order, they need to be executed. Because if they’re not, there’s absolutely no integrity in this entire system,” he said. “People say we’re racist and white supremacist—we removed people to over 140 countries last year.